1 of 5 Prepare rice mix following package directions, using very hot water. 2 of 5 Meanwhile, in small bowl, mix vinegar, mustard, salt and pepper. Whisk in 1/4 cup oil. 3 of 5 In large skillet, heat 1 tablespoon oil over high heat. Add chicken strips; saute for 4 to 6 minutes or until cooked through and lightly browned. Remove chicken to bowl; cover. 4 of 5 In large bowl, combine apple, scallion, celery, pecans and cranberries. Add hot rice, chicken, and vinegar mixture. 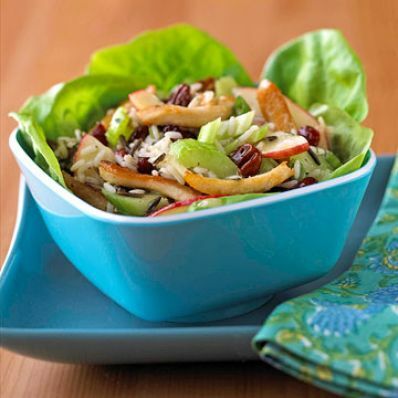 5 of 5 If desired, line a serving bowl with lettuce leaves; spoon salad into bowl. Serve immediately, or refrigerate and serve cold. Per Serving: 3 g fiber, 2 g sat. fat, 21 g pro., 406 kcal cal., 560 mg sodium, 20 g Fat, total, 36 g carb., 44 mg chol.